Andy Thomas painted this piece specifically for the 2008 C.M. Russell Museum Show and Auction. The painting (a 36" x 48" oil on canvas) sold for a record $180,000 at auction and was the "talk" of the show. Former Denver Broncos quarterback John Elway was active in the bidding, but failed in his attempt to have the winning bid. Just as Russell is well-known for the narrative in his paintings, Andy Thomas is highly esteemed for his storytelling. This piece is a particularly good example. 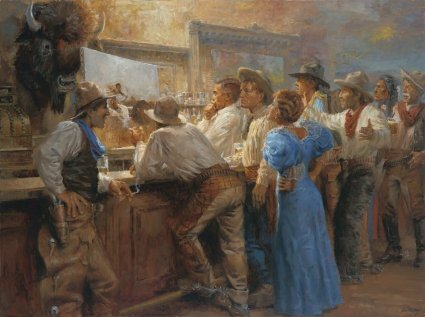 Charlie Russell shows off his newest creation to friends at his favorite watering hole, and his friends, all character themselves from an assortment of Russell paintings, crowd around to admire, and maybe critique, his work. THE TIME is the mid 1890s before Russell married Nancy. At this time, he often sold or traded his paintings to the saloons. When married, Nancy put the artist on a new marketing path. THE PLACE is the Mint Saloon. 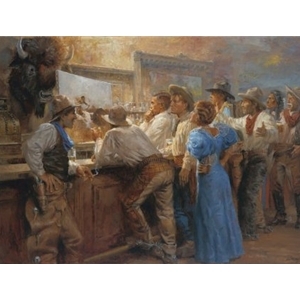 THE COWBOYS faces and clothing were taken from many Russell paintings. THE WOMAN came from the watercolor, "Just a Little Pleasure"
THE INDIAN shows up in several Russell paintings including "Joe Kipp's Trading Post. THE CHARACTER ON THE FAR RIGHT was the shooter in his painting "The Tenderfoot". The bartender did not appear in any Russell paintings, but rather makes his first appearance in this Thomas painting. Stretching Fee Applies, if you want it stretched. Additional Shipping may apply if stretched.